Barbells are long, straight, metal bars that you use as resistance for strength-training exercises. They are available in two types: regular barbells and Olympic barbells. You can do the same exercises, including squats, deadlifts, presses, rows and curls, with either type of bar. Olympic barbells are thicker, heavier and longer than regular barbells. Olympic barbells are longer and heavier than regular barbells. Most gyms and commercial fitness centers stock Olympic barbells because they hold more weight and are more durable than a regular barbell. Regular barbells are shorter and lighter than Olympic barbells, which make them better for home use. 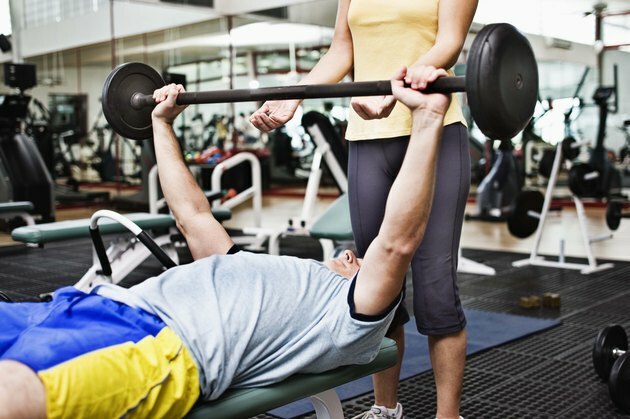 Regular barbells take up less space and are easier to manage than their Olympic counterparts. A standard Olympic barbell is 7 feet long and weighs 45 lbs. Manufacturers make smaller versions of the Olympic barbell that are 5 or 6 feet long and weigh 25 to 35 lbs. The amount of weight an Olympic barbell can hold varies, but most have a load capacity between 600 and 1,500 lbs. The center of an Olympic barbell -- the area where you grip the bar -- is a little over 1 inch thick. Regular barbells are 5 to 6 feet long and weigh 15 to 25 lbs. Most regular barbells have a load capacity of 100 to 200 lbs. The entire bar is about 1 inch in diameter. The biggest distinguishing feature between a regular barbell and an Olympic barbell is the sleeves -- the ends of the bar that hold the weight plates. Olympic barbells have 2-inch, rotating sleeves; regular barbells have 1-inch, non-rotating sleeves. The rotating sleeves on an Olympic barbell allow the weight plates to rotate as you move the bar. This reduces the amount of torque created by the plates, which provides a more secure grip and reduces stress on your wrists and elbows. Olympic barbells take Olympic weight plates with 2-inch center holes. Regular barbells take standard weight plates with 1-inch center holes. You cannot use regular weight plates on an Olympic barbell, but you can use an Olympic sleeve adapter to put Olympic plates on a regular barbell. Because they are heavier, Olympic barbells are less likely to tip over if you load the weight unevenly. If you load only one side of a regular barbell as it sits on a rack, the weight sends the heavy end crashing to the floor and propels the light end into the air.